Highland Razor Wit | Drink. Blog. Repeat. According to a friend of mine, Highland is the third-largest brewery in the Southeast, behind only Abita and Sweetwater in terms of production. If that’s true, it wouldn’t surprise me, as the Asheville-based brewery cranks out one awesome brew after another. Highland’s year-round staples – Gaelic Ale, Kashmir IPA – are solid beers, but where the brewery really shines is in its seasonal releases. Little Hump is the epitome of a light, effervescent spring beer, and Cold Mountain, with its hints of marshmallow, vanilla and hazelnut, is one of the best winter seasonals out there. 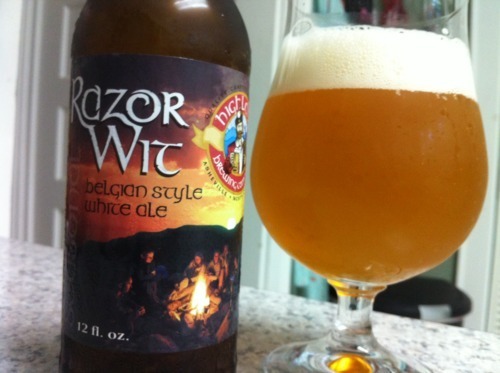 Their newest summer release, Razor Wit, continues that trend of unique yet wholly enjoyable brews. Razor Wit follows the classic brewing style for a wit – wheat, noble hops, coriander and orange peel – but the brewers added a secret blend of spices that gives the beer this amazing spicy and herbal note. It’s one of the more unique – and, to be quite honest, one of the best – witbiers I’ve had. The pour is a lush, hazy orange. About three fingers of head top it off, but that’s gone pretty quickly. The lacing is gorgeous, gripping the side of the glass and refusing to let go. But since it’s a session beer, there aren’t any alcohol legs on it. Those spices I mentioned pop on the nose. There’s a strong black pepper note to it, but also a big herbal note to it, too. That’s backed up with a sweetness from the wheat and those characteristic orange peel and coriander notes. The taste on Razor Wit is superb. There’s a medium body mouthfeel and sweet flavors of orange and tangerine that coat your mouth. But on the back, that gives way to a wet spice character. There’s juniper, caraway and black pepper, as well as the very prevalent coriander. The strength of the spice and herbal notes is balanced with the sweetness from the malt and thickened a bit by the yeast. Herbal beers can be a bit of a shock to the palate, but Razor Wit balances the stronger notes with a sweetness and robustness that makes it incredibly easy to drink. I can envision sitting on the porch with a peppered steak fresh off the grill and pairing it with this, or sitting poolside with the setting sun in the distance. It’s a nice jolt to the summer seasonals, and if you’re in Highland’s distribution area, definitely one to not miss.